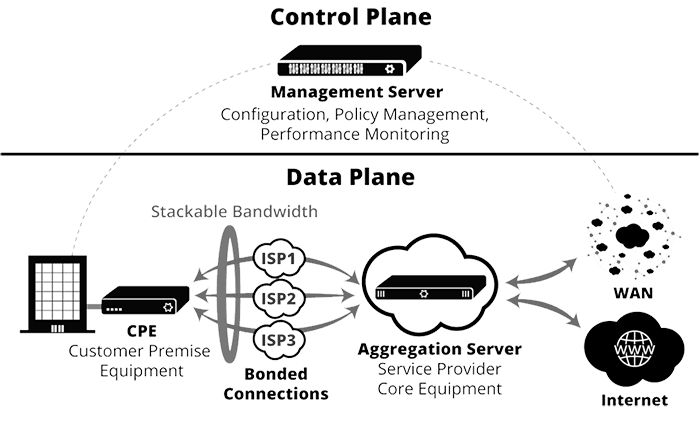 Networking software that combines multiple IP connections to create a single, smart pipe. Sufficient bandwidth, low latency, with no packet loss. Added redundancy and no dependence on a single carrier. Combines multiple readily available low-cost Internet connections. Session traffic, security, and policies. Combine the bandwidth of multiple Internet connections to increase network speeds. Conveniently apply policies on performance and usage to make VoIP calls , video and data transmissions reliable and clean. If a disruption occurs on a network connection, traffic will automatically adapt to ensure reliable service. Easily encrypt traffic between sites, overlay a centralized firewall, and transmit packets across multiple connections to add extra layers of security. Brings the capability to see the entire network – remotely. Built-in secure portal with real-time traffic analytics tracks and predicts actual usage and performance to troubleshoot and relieve IT challenges.